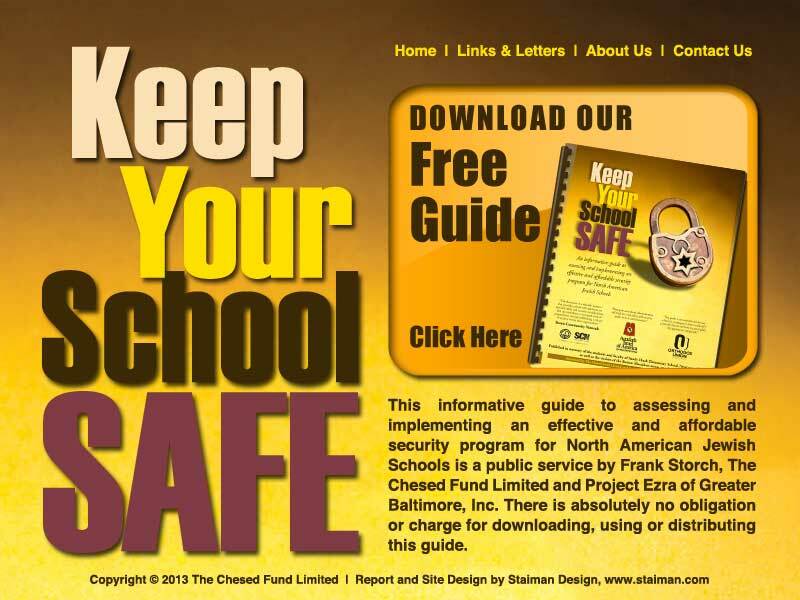 “Keep Your School Safe” is a new guidebook written by Frank Storch, security consultant and coordinator for CERT (Community Emergency Response Team) of Northern Park Heights in Baltimore. The booklet is a 40-page handbook designed to help schools, yeshivas, and other institutions where children gather, to assess their security level and strengthen it if needed. The Guide is available in hard copy, and has already been distributed widely, with 10,000 copies already printed and in circulation. Frank Storch is working hard to maximize the guide’s distribution by making it available as a downloadable PDF file on-line to anyone who wants it, for absolutely no cost or other obligation. The handbook was reviewed by security professionals, including members of various law enforcement agencies and SWAT officials. Experts in the field of security from both the United States and Israel also examined and approved the guide. Funding for the production and publication of the guide came from the Chesed Fund and Project Ezra of Baltimore, organizations in which Frank Storch has taken an active part on a regular basis in the past.